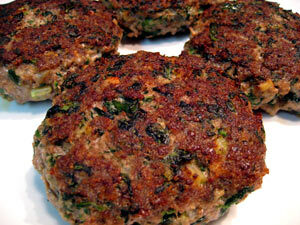 Sautéed Spinach Burgers, Mushroom Sauce, Thyme for Cooking easy main course. Don't let the greenish tinge to these burgers put you off. They fry up to a lovely dark, proper burger color, they taste fantastic and you get a healthy dose of vegetables almost without noticing! Finely chop onions, celery, mushrooms and garlic. In large non-stick skillet over medium heat sauté half of onions, celery, garlic and mushrooms about 5 minutes or until tender. If using fresh: roughly chop and add to the skillet for the last minute or until wilted. If using frozen: thaw spinach and squeeze out all liquid. In a large bowl lightly beat the egg. Add bread crumbs, 2 tbs of red wine and thyme. Mix well, then add the beef, spinach and sautéed onion mixture. Mix well - hands work best, and form into 4 patties. Heat remaining 1 tbs of oil in the same skillet, add patties and sauté about 5 minutes per side. Remove, put on oven-proof plate or platter and put in 250F (125C) oven to keep warm while you finish sauce. Add remaining onions, celery, garlic and mushrooms to skillet and sauté about 5 minutes or until tender. Add 1/2 cup red wine, beef stock and tomato paste to pan and bring to a boil. Dissolve cornstarch in remaining 2 tbs of red wine (or water) and add to sauce, stirring constantly until thickened. 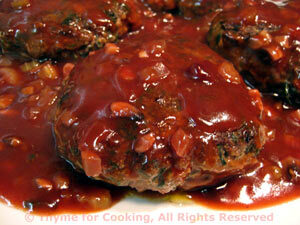 Remove patties from oven, pour some of the sauce over and serve with remaining sauce on the side.